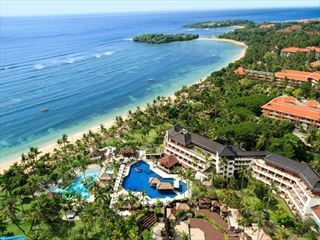 Nestled directly upon the fine white sands of Jimbaran Bay, one of Bali’s finest beaches, this luxurious resort is adorned by luscious island foliage and showcases phenomenal views of the azure Indian Ocean. A haven of pure luxury and relaxation, Jimbaran Puri is managed by the prestigious Belmond brand, promising exceptional service and comfort for an idyllic Balinese beach escape. Each luxurious, oversized cottage reveals an interior of cool marble interiors, sumptuous teak woods and high-beamed ceilings, while breath-taking views of the pristine beach and luscious gardens invite you to step outside amid your own sumptuous sanctuary; amenities include a plush king-size bed, nightly turndown service, complimentary Wi-Fi access and a luxurious terrazzo bathtub to soak up your sublime surroundings. 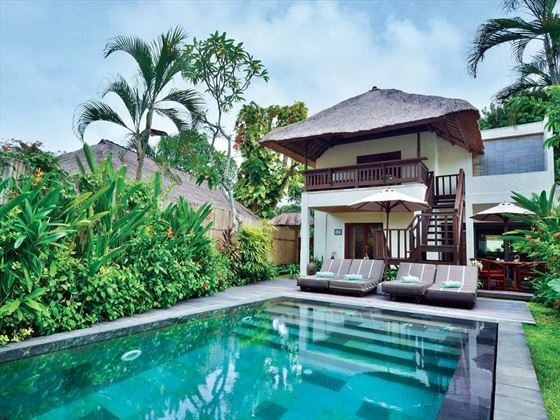 We love the selection of decadent pool villas, ranging from one-bedroom hideaways for romantic getaways and honeymoons, or two-bedroom sanctuaries ideal for fun family getaways. Home to some of Bali’s greatest restaurants, Belmond Jimbaran Puri weaves vibrant Indonesian flavours with western elements for a truly wonderful dining experience. Follow the delectable aromas of French, Mediterranean and Indonesian flavours to Nelayan, nestled along the soft, velvety sands and moonlit Indian Ocean, whilst romantic glowing lanterns create an intimate feel. All food is created using organic vegetables, fruits and spices, all locally-grown in famous Bedugul Farms. Meanwhile, Tunjung couldn’t offer a more idyllic setting to enjoy delicious continental breakfasts and classic Indonesian fare with a contemporary twist, served beside a gorgeous lily pond and magnificent views of the bay. Your time here will be spent lounging beside the beautiful infinity-edge pool, or unwinding upon the pristine private beach. 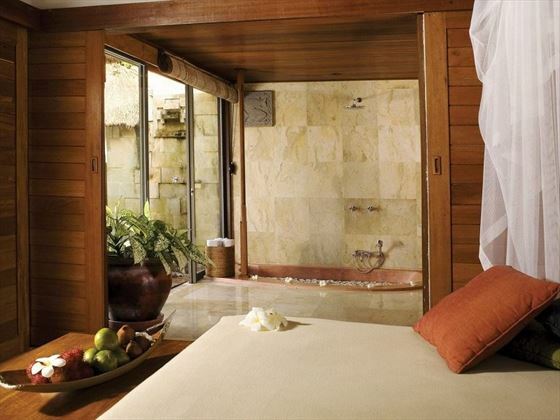 There’s a luxurious beach spa with three ocean-view gazebos for romantic couple’s treatments, or delight in a private massage within the comfort of your villa. 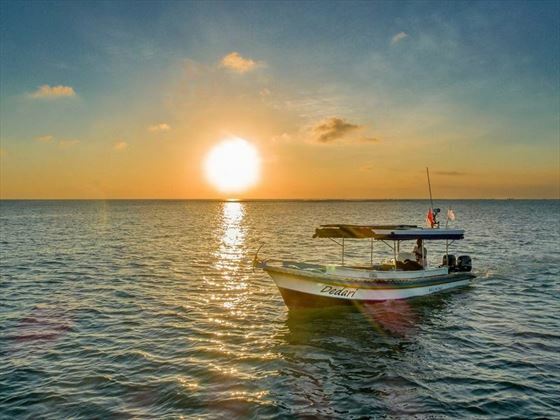 A full range of immersive excursions and guided tours allow you to explore the verdant surrounding landscapes, glistening ocean and magnificent temples nearby. 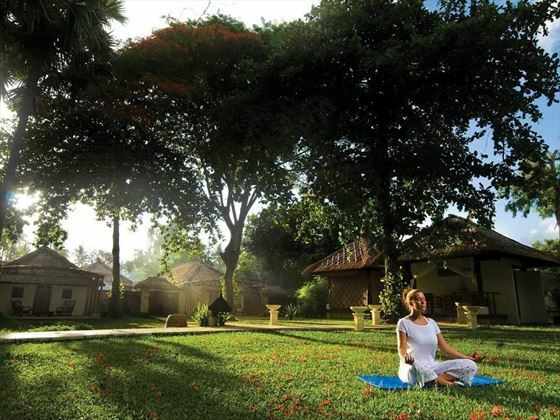 Relax and rejuvenate with fantastic yoga, tai chi and meditation classes, whilst families can make use of babysitting services, a separate children’s pool and special menu options in the child-friendly restaurants. 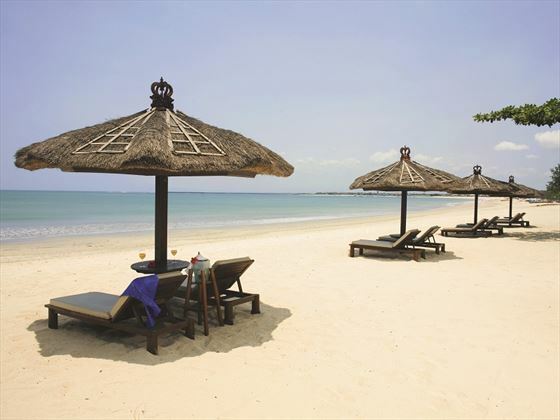 Set upon the silky soft sands of one of Bali’s finest beaches, Belmond Jimbaran Puri is a 15-minute drive from Kuta and Nusa Dua. 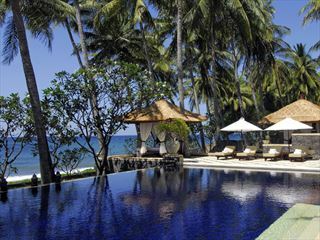 The location is perfectly secluded, tucked away from the busy main road that runs through Jimbaran Village. Take a short stroll down the beach to find a number of famous seafood restaurants nestled directly on the sand with beautiful ocean views. 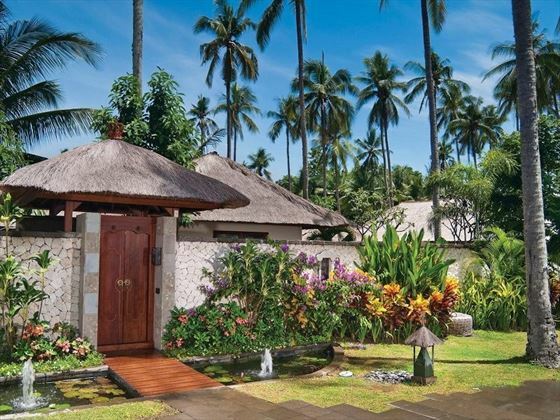 Appointed with cool marble floors, teak woods and high-beamed ceilings, these 120sqm cottage suites showcase traditional Balinese design partnered breath-taking beach or garden views from a private, secluded terrace or wooden deck surrounded by luscious palms and fresh island blossoms. Accommodates up to three adults. Designed with a similar layout and luxury amenity list as the standard Garden or Beach View Cottage Suites, these charming stand-alone cottages span over 120sqm of sumptuous, airy living space with spectacular garden views from floor-to-ceiling glass windows. Accommodates up to three adults. 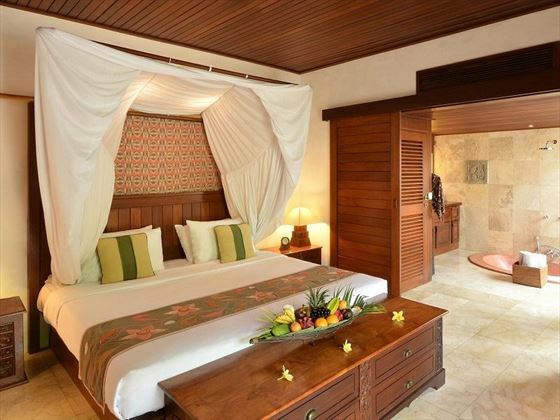 Step inside these magnificent, stand-alone 140sqm villas to discover a bright, airy living space accented with rich teak woods and luxurious décor, with a private garden, swimming pool and phenomenal garden or ocean views; a wonderful choice for romantic couples. These sumptuous duplex villas offer incredibly spacious island living, perfect for sharing with family or friends. On the ground floor, you’ll find a master bedroom with a king-size bed, and a staircase leads to the upper floor which features a spacious twin bedroom. Additionally, there’s a spacious living and dining room, an upper-floor balcony, two luxurious bathrooms and expansive private garden with an infinity-edge pool. 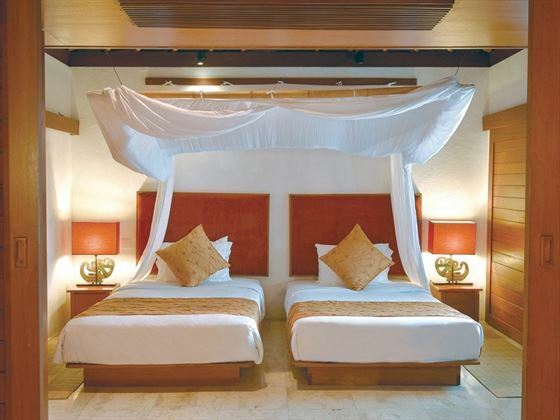 Accommodates up to four guests. 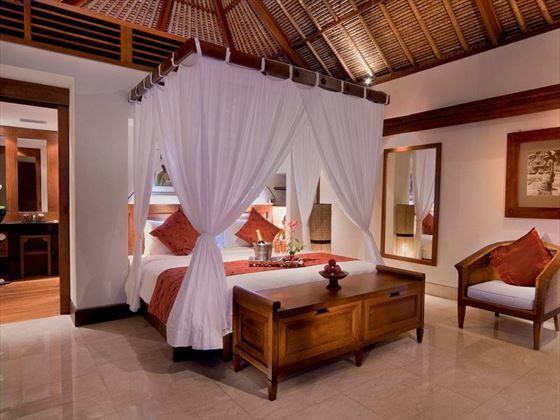 For an incredibly indulgent stay in Bali, these intimate 350sqm sanctuaries are hidden behind gorgeous manicured gardens and serene lotus ponds, exuding a secluded and romantic feel. 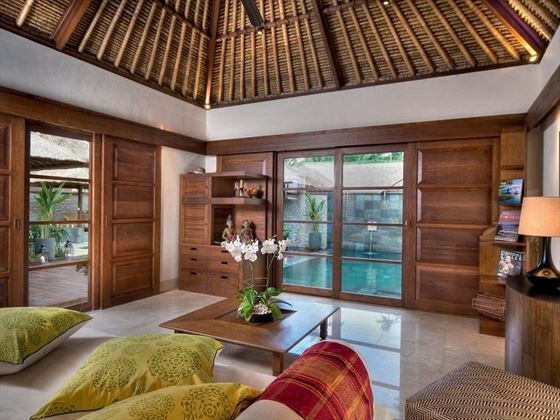 Appointed with a sumptuous blend of classic Balinese décor, ultra-modern amenities and a luxurious selection of exclusive privileges including private butler service, these villas are the perfect choice for an unforgettable Balinese honeymoon filled with blissful memories and romantic moments. Nestled along the soft, velvety sands, glowing lanterns and moonlit Indian Ocean, Nelayan offers a truly spectacular dining experience. Follow the mouth-watering aromas of French, Mediterranean and Indonesian flavours, complemented by freshly-caught seafood from Jimbaran Bay and organic vegetables, fruits and spices, all locally-grown in famous Bedugul Farms. 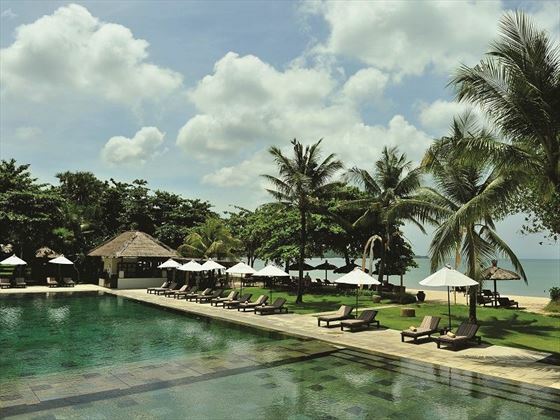 Set overlooking a beautiful, serene lily pond and stunning views of Jimbaran Bay, Tunjung couldn’t offer a more idyllic setting to enjoy delicious continental breakfasts and the vibrant flavours of classic Indonesian fare. As the sun rises into the clear, azure sky, start your day with a colourful buffet of fresh, exotic fruits, warm home-cooked pastries, tropical juices, international cheeses and cured meats. By night, this laid-back café transforms into an intimate dining venue, where Executive Chef Adi Wijaya blends the finest produce and modern cooking techniques to create a masterful selection of Indonesian and Balinese dishes with a contemporary twist. An oriental-style bar offering one of the most picturesque sunset views in Bali, serving a delectable menu inspired by the light, clean flavours of Asian cooking. 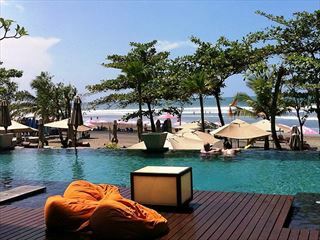 Fresh, hearty dishes, colourful sands and cool, zesty juices can also be enjoyed poolside as you unwind on a plush daybed.